Hemochromatosis is a leading cause of iron overload disease. People with Hemochromatosis absorb extra amounts of iron from the daily diet. The human body cannot rid itself of extra iron. Over time, these excesses build up in major organs such as the heart, liver, pancreas, joints and pituitary. If the extra iron is not removed, these organs can become diseased. Untreated Hemochromatosis can be fatal. I see. I have another on-line friend that I think has the same thing. I know she has to be "bled" every so often. LOL.. I was wondering who would be the first to mention leeches.. and no thank you to 'that' holistic therapy. Glad they discovered your problem. Considering the alternatives I think this is the best choice. 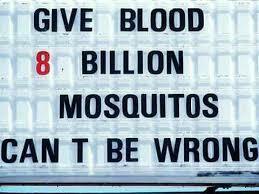 Love the little blurb about billions of mosquitos can't be wrong. Funny but true. I never heard of this before!! Thanks for making people aware. I am so glad they caught yours in time! Just got a tweet from a guy in Cleveland saying that he "was just diagnosed at age 64. Alas, much damage already done. 2x liver. enlarged heart diabetes joint pain cataracts." Please be sure that your doc checks your iron level the next time you get your blood checked. I have been getting phlebotomies for close to 12 years. Sometimes a not so experienced nurse will get a chance to practice on me. Finally they stop shaking and get the needle in my arm. Often they screw up and don't get enough blood removed. I just might have to get me some leeches. I used to live in Hawaii and I think the mosquitos actually helped keep me alive. So maybe the nasty little critters are good for something after all.